Press an unwashed finger onto coupons of copper (C110) and stainless steel (S304). Stainless Steel - stainless steel tableware, or other uncoated stainless steel surface. Set aside coupons for three hours at room temperature (around 68F). 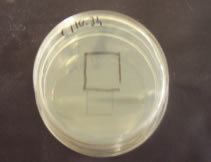 Press coupons onto nutrient agar plates, and incubate the plate at ~100F overnight (12 hours). 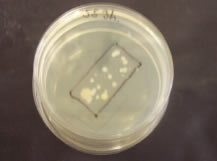 NOTE: Nutrient agar plates may be obtained from a local hospital or from a science supply house. Homemade plates can be fashioned from a small empty cup lined with a double thickness of foil and fat-free beef or chicken broth. Instructions can found at the science projects web site. Copyright 2007 by ClearWater Tec S.L.